Not only is too much uncontrolled stress bad for health, your well-being and quality of your life. It disconnects you from the real powerful person, who you truly are and cause a state of imbalance in the body. Stress and tension are your biggest enemy that you will ever have to face. Because not only does cause feelings of immense discomfort. It also interferes with your short term memory, blocks off your creativity and stifles your ability to focus and concentrate. "There are no stressful situations, only stressful responses". These days many people are to stressed and to overly stimulated. To a large degree with have forgotten the general healthy ways and principles of life and many people are suffering the consequences of it. Many people are stuck in worry and survival mode. It seems nearly everybody is feeling mentally and emotionally overwhelmed. So many people are overly stimulated. We all want success and everything instantly and everybody appears is in a frantic rush to have things or get things done and people are paying the price for this. Much of the time. People's mind and body are being over stimulated, leaving their body stuck in a damaging, tense and physical state of stress. There are so many people who struggle to sleep and relax. Many people have got to much going on in their mind. Maybe they are planning ahead or they are feeling emotionally overwhelmed, because of all the things they have got to do or deadlines they convince themselves, they have to meet. Others are emotionally stressed and overwhelmed. Because they are constantly worried, they are fighting with a problem or they are trying to deal with challenging situation. Many people's lives are built around mental and physical stimulation. If you don't slow down at times and if you don't take good care of yourself each and every day. Which should involve a bit of mindfulness incorporated with rest, relax, take it easy, sit still and breathing at time, especially on the onset of any build up of stress or tension. Then it can result in chronic stress. Which can eventually lead to burnout, tiredness and fatigue or unpleasant physical symptoms or manifestations in the body. It is incredibly important to listen to your body. Because stress, tension, exhaustion and fatigue are a sign that you need to slow down, rest and relax. The trouble is, most people ignore these important messages from the body. Some even do the opposite to what the body is trying to tell them and they override the signals to rest by having a stimulating drink full of caffeine and high levels of sugar. We all have a to do list, which for some. All their tasks have to be done instantly and as fast as it possible can. They trouble is fast equals tension and stress and for some their to do list never ends . Stress and tension is designed to push and motivate you to take immediate action in the case of immediate danger. The trouble is many people are pushing themselves to the limits when there are no real genuine risks or dangers. Because of all their emotional stress, tension and overwhelm. Many people feel restless and they just can't chillout, sit still for a few moment, breathe and experience the calm and bliss of, grounding themselves in the now. Some people even think that relaxing is bad and it means your lazy. The truth is, relaxation is a necessity and a must. If you want to be healthy, look and feel younger, feel happier, sleep better, feel calm, live longer and be at your peak performance best. The funny thing is. The more you rush and hurry the less efficient you become and you don't perform as good as you would if you were more calm and composed. To some. Stress and tension becomes their new and normal, default setting. When you have become highly stressed. Because it takes up to 36 hours to burn off all the excess adrenaline and stress hormone cortisol. As most people, get stressed and emotionally and mentally overwhelmed each and everyday. They never allow their body to return back to its natural and healthy, resting state. Therefore, they are constantly stuck in a state of stress and when you're stuck in a state of stress your focus of attention becomes narrow and focused on the problem or worry. When really, you should be more relaxed and focusing your powerful and creative mind on finding the solution or answer to your problem, issues or challenge. The antidote to stress and tension, is calm and relaxed. The secret is to start to slow down more and more, let all the tension and stress melt away, breathe naturally and rhythmically, reconnect with your body and learn how to still your mind. As this will allow you to relax and feel good which will let you tap into your true inner powers, intuition and wisdom. During times when we feel stressed we often feel the build up of tension in our stomach,shoulders, chest neck, back, forehead and jaw. When the body is stressed and tense we tend to have more tense and stressful thoughts in the mind. Once you're feeling more relaxed and peaceful. You will feel more resourceful and better equipped to deal with whatever was stressing you out. At times of stress or whatever it is that is causing your worry or stress, it is incredibly important that you take a few moments to relax and try and restore a bit of much needed calm and restoration. Because no matter what is going on in your life at the moment or no matter how challenging things may be for you right now. You're going to benefit tremendously and you'll find it much easier to resolve your problem. If you allow yourself a few moments each day to let yourself relax, switch off from whatever it is that is bothering you for a few moments and just chill out and let it all go. So you can just forget about it and focus on giving yourself some much needed rest and relaxation. The really important thing to be aware of is. If you have a problem or challenge to deal with or overcome. Then it is of utmost importance that you try and relax, clear your mind and then try and deal with your problem, difficulty or challenge in the most calm and best way that you can. Do not let it stress you out and avoid taking your external problems or issues, inside. Otherwise it will stress you out and mess you up on the inside. Accept it, deal with it has calmly as you can and then let it go. If you spend some time relaxing deeply and calming your mind and body. Then once you are in a more calmer and better feeling place. You can come back to your problem, challenge or struggle, with a clear mind and a new sense of calm, peace and focus. This will help you to be able to find a solution and it will also allow you to be able to do the things or make the changes that are necessary to let you come through that period of stress, challenge or problem. We all have to face stressful and challenging situations. When you're stuck in a period of stress or frustration. Then you need to allow yourself some time deeply relaxing, so you can come through it and get to the otherside of it. Otherwise, you will stay stuck in a stressful state and each day the stress will accumulate, until you reach breaking point or your health and wellbeing begins to suffer. Things will get better and all problems and challenges can be resolved or overcome a lot quicker and more efficiently. If you would only relax, let it all go and just get away from whatever it is, that is stressing you out. Stressing yourself out and getting emotionally upset, annoyed and frustrated by whatever it is that is causing you the problem. Will not resolve or fix the problem. It is an opportunity for you to instantly train yourself to relax so you can bring your mind and body back to its natural state of calm and balance. Mindfulness is one of the key elements of eliminating your stress. Controlling your breathing and learning how to relax is the holy grail as far as stress management is concerned. When you notice the onset of any stressful responses or every time your mind wanders onto negative, thoughts of worry or stressful and imaginings. Immediately, put all your attention onto relaxing. As you inhale and exhale. Smile, and think of the thoughts. "Breathe in calm and breathe out tension". Watch your chest rise and fall. Breathing is your life force energy. Learning how to control and regulate your breathing can help you to stay calm, cool and composed in all those situations where before you might have responded with stress, anger and anxiety. Any kind of tension in your body can interfere with your breathing which can change your whole physiology. Anytime you have to face a stressful or challenging situation. Take some deep breaths. Take a deep breathe in, and breathe all the way in. Then, just release, without forcing your breathe all the way out, and repeat as many times as needed. As this, will learn to train your mind and body to remain calm, in those once previous, challenging situations. Imagining yourself on a tropical beach, on the onset of any stress, can also quickly calm you. The secret is to act and take control of your body, before the momentum as a chance to build. Catch it early and change it. Stress and tension are a physical symptom that cause a build up of pressure in your mind and body. Therefore, if you have already become tense, angry or stressed. Then it is important to burn off all that adrenaline and extra energy, otherwise you won't switch of the stress responses and you will remain in a stressed and tense state of being. Exercising or working out, will help you to burn off that harmful adrenaline and high levels of energy. By far the best antidote to stress, anxiety and negative emotions is to develop the therapeutic and self healing art of relaxing. Many people regard relaxation as waste of time or a luxury thing or something they give themselves as a treat. If you think that there are much better things that you could be doing with your time, rather than relaxing, then you couldn't be further from the truth. Relaxation is not a indulgence, it is a necessity and it is absolutely vital for your health, performance levels and well-being. Regular relaxation, is necessarily to manage and reduce your stress, help to repair and recharge your body, help you to sleep better, empower you, boost your self confidence and bring about blissful feelings of inner peace, balance, flow and harmony. When our mind and body is calm and balanced, your mood will improve, it will reduce the chances of you catching colds and viruses and you will be more able to deal with life's challenges and adversities. If you live a busy and hectic life and you think that you have not got time to relax deeply each day. Then, you need to find the time, because it is that important. 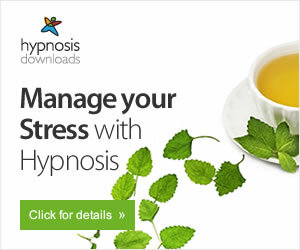 Hypnosis and meditation are great ways to relax deeply, reduce your stress, solve your problems, change your feelings, improve the quality of your sleep and repair your body. Stay out of your negative past, stay in the present moment, be grateful for the now and create positive expectations for your future. Thought and emotional suppression is one of the single biggest causes of stress, obsessive negative thinking and negative emotional trauma and suffering. Therefore, learning how to express and release your emotions is an important skill to have to help to reduce your stress and eliminate your emotional suffering. Otherwise, if you continue to suppressing your thoughts and feelings then they will always find an outlet in your body. Because all suppressed thoughts and feelings will express themselves negatively in your body in some unpleasant physical form or feelings of physical and emotional discomfort. If you suppress your thoughts and feelings. Then you will never process the emotions, eliminate them and move on, and your body will have to carry the burden of your suppressed emotions. Always acknowledge and express your feelings and admit to yourself, that you're feeling negative emotions. Because by doing this you will process the emotion ad you will begin to free yourself from your feelings of discomfort and emotional suffering. "I am feeling hurt. How I would like to feel is happy and at peace"
"I am feeling anxious. How I would like to feel id peaceful and calm"
"I am feeling angry. How I would like to be is calm and assertive"
You can also write how you're feeling down on a piece of paper or how you were feeling in a previous stressful situation as this is a great way of expressing and releasing your emotions. When things are going wrong all the time, you can end up in a vicious and continuous stressful and worry cycle. If this is the case. Then it is very very often, a lot easier to change your feelings rather than trying to change your thoughts. A change of attitude or an attitude of accepting your situation or not caring to much is also a good way of expressing and processing your emotions. When you're coming from a negative, stressful or bad feeling place. Focus on relaxing and feeling good, then start to change your thoughts. A better way of controlling your emotions is by teaching yourself how to respond in a more calm, assertive and controlled manner, so you don't become stressed, anxious or angry in the first place.